I don't make Military items, but this was a paid for commission and that person has allowed it to be shared with you all. 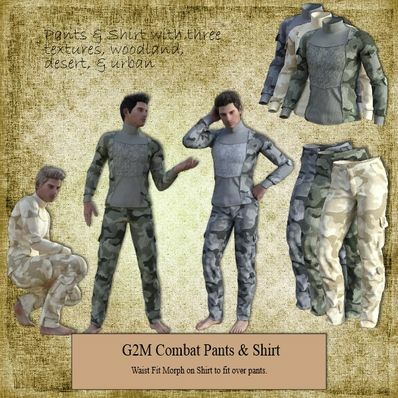 Combat Pants & Shirt for Genesis 2 Male for use in Daz Studio 4.8. Love it - for my motorcycle ;) Currently my absolute favorite. I would also like these clothes for Genesis and Genesis 3. For the figure Genesis I have Morphs, which I would gladly use, for Genesis 2 unfortunately not. Thanks for another fine outfit. Very nicely done. Thank you for sharing. Very nice, love the cargo style pants! I am definitely not a fan of the military, but this set is a must-have! Thank you very much! Though the textures are far too good to be wasted I'll use the clothes for my adventure and scifi scenes. @rogerjhardy100 - Have you seen the basic military uniform I made? It has epaulettes on the shirt. Thank you for going against your principles again. Your efforts are much appreciated. Hi, always the perfect work. Thank a lot.